Eternal Orthodox Church calendar for the 11.12 year 2017. As aforetime Hannah the mother of Samuel, so Anna the mother of Stephen prayed God to give her a son. Praying thus at one time in the Blachernae church in front of the icon of the most holy Mother of God, a light sleep fell on her, in which she saw the holy Virgin, radiant like the sun, and heard her voice: "Woman, go in peace; in fulfilment of your prayer, you have a son in your womb." Anna indeed conceived and bore a son, this holy Stephen. He received the monastic habit at the age of sixteen on Mount St Auxentius near Constantinople, at the hands of the elder John, from whom he learned divine wisdom and asceticism. When John entered into rest in the Lord, Stephen remained on that mountain in strict asceticism, taking on himself labour upon labour. His holiness drew many disciples to him. When the Emperor Constantine Copronymos began to persecute the icons even more ferociously that his foul father, Leo the Isaurian, Stephen showed himself to be a zealous defender of the veneration of the holy icons. The demented Emperor listened to various slanders against Stephen, and himself devised a number of intrigues, solely to break Stephen and get him out of the way. 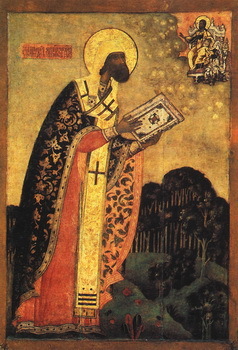 Stephen was exiled to the island of Proconnesus, and then taken to Constantinople, put in chains and cast into prison. There he met three hundred and forty-two captive monks, brought from all sides and thrown into prison for their veneration of icons. In the prison, they followed the whole order of church services as in a monastery. The wicked Emperor condemned Stephen to death. The saint foresaw his death forty days before, and took his leave of the brethren. The Emperor"s servants took him from the prison and, beating and buffeting him, dragged him through the streets of Constantinople, calling on all who were on the Emperor"s side to stone this "enemy of the Emperor". 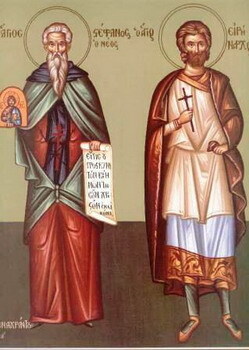 One of the heretics aimed a blow at the saint"s head with a piece of wood, and the saint breathed his last. As Stephen the Protomartyr suffered at the hands of the Jews, so this Stephen suffered at the hands of the iconoclast heretics. This glorious soldier of Christ suffered in the year 767, at the age of fifty-three, and was crowned with unfading glory. He was an Albanian Christian living in Constantinople, and was a gardener by profession. In the course of selling his fruit, he incurred the resentment of a Turk who slandered him to the judge, saying that he had promised to embrace Islam and then retracted. After interrogation, he was put in chains and thrown into prison. In prison, he was urged to eat, but he refused, saying: "It is better for me to go before my Christ fasting." After that, he took out some money that he had concealed under his belt, and gave it to one of the captives with the request that he use it for several liturgies to be celebrated for his soul. He was beheaded by the Turks in 1748, and was glorified forever in the Kingdom of Christ our God. A woman of gentle birth, she was tonsured as a nun after her husband"s death by St Stephen the New. The Emperor Copronymos urged her to say that she had had physical relations with St Stephen, in order to humiliate him before the people, but this holy woman refused to become involved in the Emperor"s intrigues against the saint, whom she venerated as her spiritual father. She was whipped for this, and then thrown into prison, where she gave her holy soul into God"s hands. He was murdered along with his six sons by the Emperor Phocas in 602. The Holy Martyrs Stephen, Basil, Gregory, another Gregory, John and many others suffered for the veneration of holy icons with the MonkMartyr Stephen the New, with whom they languished together in prison. After his martyr's death, they were executed.